All A Bunch Of Momsense: Treat Your Tootsies Giveaway Winner! Treat Your Tootsies Giveaway Winner! A big thanks to all of you who entered and left me comments! 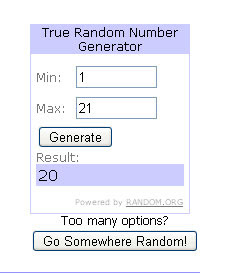 We had a total of 21 qualifying entries, and I used Random.Org to pick a winner! Our winner is Jackiedlc from A Step At A Time! Congrats, Jackie! Please email me at allabunchofmomsense (at) gmail (dot) com and I'll get your prize on its way! As for the rest of you, don't give up hope! There will be more great giveaways soon! Congrats, Jackie - and, Megan, that was such a fun thing for you to do!!! Have a great day, you two!